Sports video games have come a long way since 1958’s Tennis for Two which was something like a tennis match displayed on an oscilloscope. And who could forget Pong circa 1972?! At one point in time, namely the ‘80s and ‘90s, many video games were rooted in actual sports and fans’ desires to experience the thrill of victory and the agony of defeat without ever leaving their living rooms or going to the gym. (I suppose that’s still true.) Here are just a handful that were not only huge hits in their day but also introduced — or at least popularized — particular game mechanics that we still see in use today. One of my earliest memories of sports in video games is sitting on the floor in front of my friend’s TV cranking out home runs via R.B.I. Baseball. Released in December of 1986, a little less than one year after the Nintendo Entertainment System (NES) first came to America, this baseball game was both easy to learn and very fun to play. It was also one of the first sports games to ever have real-life player names on the roster. Not only that, but they each had their own stats and different stamina levels as well. This means that a pitcher (Nolan Ryan) would tire out in later innings and a left fielder (Vince Coleman) would be faster than most at stealing bases. Sure, that’s commonplace nowadays, but back then this was a huge development. If the word “boomshakalaka” means anything to you, then you’re probably no stranger to the massive basketball game franchise that is NBA Jam. With elements such as no fouls, jumping twenty feet in the air to dunk the ball, and literally setting the ball on fire after making a few baskets in a row, NBA Jam was the silliest b-ballgame in history. Developed and published by Midway in 1993, this video game was also instrumental in popularizing secret codes and arcade myths that would become standard fare in the early ‘90s via Mortal Kombat 2. NBA Jam showed us sport games could be enjoyable even for people who weren’t into sports. 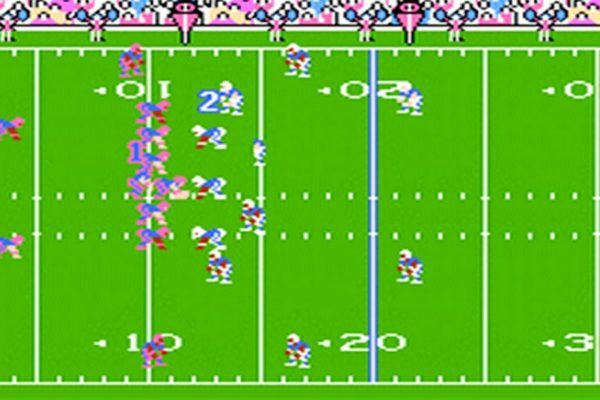 The first football game to feature real NFL players — like Dan Marino and Jerry Rice — was the breakout arcade hit Tecmo Bowl which eventually made it to the NES console in 1989. This one also introduced the now standard playbook which allowed you to choose offensive and defensive tactics. Later, John Madden Football expanded this concept with a larger variety of plays. (Who could forget that hilarious ambulance in Madden ‘92 that would run over other players while rescuing the injured one?) Madden ‘92 also gave us our first taste of pre-season, regular season, and playoff levels as well as sudden death tiebreakers. 1994 brought us a truly timeless gem with NHL ‘94 developed by our current sports game publishing juggernaut EA Sports. Like R.B.I. Baseball, this game allowed fans to choose real-life players and teams because it was signed off on by both the NHL and the NHL Players’ Association. (Everyone wanted to draft Wayne Gretzky!) What also made this game stand out was that it was so damned easy to pick up and play. Full of wonderful little touches such as team-specific music triggered whenever a goal was scored and glass-shattering effects to up the realism, NHL ‘94 definitely set the standard for all hockey games going forward, right up to this very day. We wouldn’t have the manager and the career modes in modern sports games as we know them without 1994’s Sensible World of Soccer. This game allowed players to manage a soccer club through 20 seasons by doing things like buying and selling players based on stats then keeping them by winning various competitions. The game is so successful that there are still tournaments going currently around the world. Now that’s something you can’t say about a lot of games developed in the ‘90s.